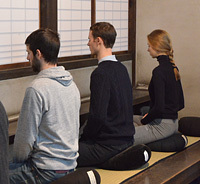 Anyone interested in Zen practice is welcome to join our Zazen-kai (meeting for Zazen practice) conducted in English. Meeting at Reception Desk (Sōuketsuke). *Please wear loose and comfortable clothes.